Negus is the Highest rated STUD male German Shepherd in North American and the Only STUD of this Quality in Canada. We are the Youngest and the Smallest Hobby Breeding Kennel in North America to have a VA Champion. ﻿Our goal is to produce sound dogs with great temperament, beautiful disposition and fantastic personalities, dogs that are﻿ easily trainable. The quality ﻿of our dogs is second to none﻿. Being a small Selective Breeder we have the time to give plenty of love and individual attention to each of Our Puppies and Dogs. We breed few litters because we believe in putting out Quality NOT quantity. We personally know our dogs, they live with us in our home with our kids and pets. It is always the result of intelligent ﻿effort". ﻿Von Aries German Shepherds are bred absolute from the TOP quality West German Show lines. Our breeding stock is imported directly from Germany or out of Imported stock. They carry only the best bloodlines and come from the finest German kennels. Each of our adult dogs used in our breeding program have certified hips and elbows, Working Titles and highest show rated. We focus on producing a dog with solid temperament, correct structure and good health. 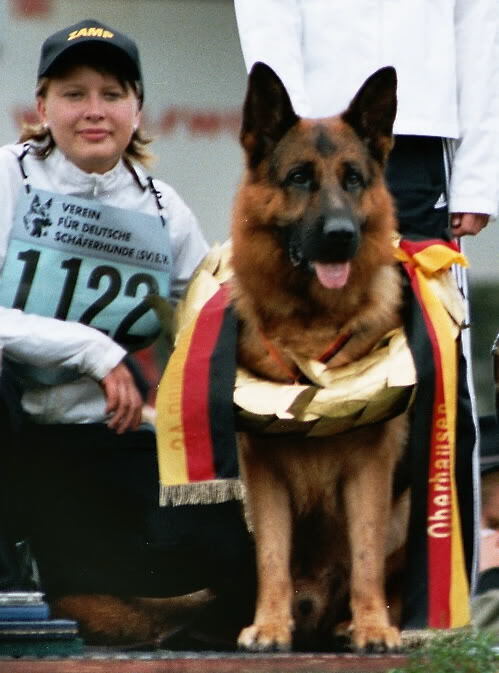 While we show our dogs in the German style conformation ring and title them in the sport of Schutzhund they are first and foremost members of our family. In addition to prospects for show, schutzhund and obedience our dogs and puppies make wonderful family companions. Von Aries Puppies are deep red and black in colour, sound temperament, fantastic structure, amazing personalities and trainability like no other; they turn heads anywhere they go. 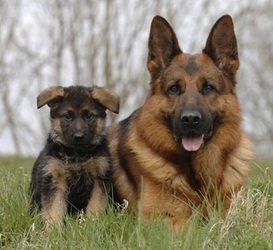 If you are in search of a German Shepherd for sale, whether a puppy, young adult, stud, trained protection dog, executive protection dog or elite family and estate security dog you will find it here. Look no further than Von Aries German Shepherd, for it is here that you will find the finest quality pedigreed German Shepherd Dogs for sale. Our German Shepherd dogs are our family; they are our pride and our passion. We ensure the welfare of our dogs by only selling them to responsible, loving homes not just in Canada and US, but all over the world. We encourage a continued relationship with all who purchase our German Shepherd puppies or adults. We look forward to getting feedback from the owners or hearing stories of their puppies or adult dogs because, after all they are our extended family. Von Aries German Shepherds, a German Shepherd breeder located in Milton, Ontario, Canada. We offering Pure bred CKC registered German Shepherd litters of puppies for sale from highest quality German Shepherd pedigrees. Our main objective at Von Aries is to produce the best German Shepherd litters of puppies for sale in the world. We take great pride in our quality. Breeding to top producing west German Sieger show Line German Shepherds is number one in producing quality German Shepherd puppies for sale. 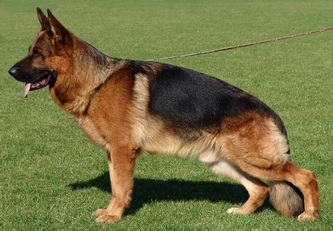 Being a German Shepherd dog breeder requires breeding high quality German Shepherds from some of the top rated German Shepherds in the World. As a German Shepherd breeder and source of German Shepherd puppies for sale in Ontario and North America, we strive to be consistent with the quality of our German Shepherd puppies for sale which means breeding with top rated German Shepherd breeding stock of some of the best German Shepherds in the world. If you are in search of a German Shepherd for sale, whether a puppy, young adult, stud, trained protection dog, executive protection dog or elite family and estate security dog and you are located in Milton, Ontario, or anywhere else in Canada, or in USA, look no further, for it is here that you will find the finest quality pedigreed German Shepherd Dogs for sale. Breeding quality German Shepherd puppies is our passion and we are committed to offering our clients excellent German Shepherd puppies for sale with a dedication to increasing the quality of puppies with each selective breeding. Our pure bred German Shepherd puppies for sale are registered with the Canadian Kennel Club, and/or American Kennel Club or the SV in Germany. Our German Shepherd litters of Puppies for sale are excellent for families —good with children, adaptable to any environment and very easily trained. Our German Shepherd puppies have super character, rich black and red color and of course sound temperament. As a German Shepherd breeder, we are not like other German Shepherd Breeders, we breed world class German Shepherd dogs from west German Sieger show lines and adhere to the German SV Standards. Our German Shepherd puppies for sale are the product of breeding dogs with great temperament backed by elements like attentiveness, assertiveness, self confidence, courage, highly trainable, willingness to work whatever is desired on command. They are superior in health with parents being x-rayed with clear hips and elbows by ONLY the SV (GERMANY) . These German Shepherd litters of puppies for sale will make great companion dogs as well as excellent conformation, show and working dogs. Their inclination towards making their masters happy, their mental soundness and their high degree of intelligence have made this dog a successful working dog and masterpiece companion for their owners. As a German Shepherd breeder we strive to breed German Shepherd puppies for sale that will have rich black and red color along with excellent temperament and structure. We also breed our German Shepherd dogs to produce puppies for sale that are good for sport and show and excellent with families. Our German Shepherds puppies for sale are intelligent and eager to please their owners. We are the best select German shepherd breeders producing German Shepherd litters for sale for family, show, or companion dogs. Focusing on super character, rich black and red shepherds. At Von Aries we are a German Shepherd breeders of pure bred German Shepherd puppies for sale. We are the premier, selective German shepherd breeder in North America, producing strong, sound, healthy German Shepherd Puppies for family, show, or companion dogs. Focusing on super character, rich black and red German Shepherd puppies for sale. We are German Shepherd Breeders and import German Shepherd Dogs for Sale. We breed, import and ship world-wide. #1 Breeder. Many of our dogs and puppies are imported directly from Germany from west German Shepherds breeding stock. Pedigrees and Progeny photos are available for viewing for each stud dog and breeding female. All shepherd puppies are home raised and socialized. Temperament of our dogs and puppies are unmatched by any other breeders. We sell only top quality puppies and provide the best written warranty for all sales. Our goal is your satisfaction with your puppy or dog. We breed Show Quality, for Family Protection, Personal Security, Schutzhund, Search & Rescue, Guard Dogs, Seeing Eye Dogs, Professional Dog Training, Stud Service and Pet Quality, K-9. For those of you local in Toronto, Mississauga, Or anywhere in GTA Puppy and Dog training is available.